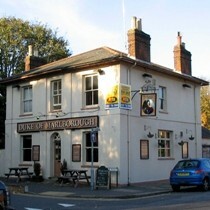 The Duke Of Marlborough in St Albans is a large traditional pub at the foot of Holywell Hill that has recently undergone a refurbishment. The pub is split into two rooms that are both fairly small but enough to have three or four tables with seating. Possibly the back room is a little more comfortable of the two. The selection of real ale at the time of the visit was a little limited with Youngs and Spitfire available. Lager choice was a little better, offering Stella, Hoegarden and another premium lager that I can't spell or pronounce. Around 8pm on the Wednesday of the visit there was only a couple of other people drinking. Although the pub was fairly empty it was a fine place to pop in for a drink and a chat. A plasma tv in the front bar was showing football but the volume was fortunately kept quite low. Rugby memorobilia, mainly Australian teams' shirts, decorated the walls of the front room. Nothing particularly wrong with this pub, it's a little quiet but for those passing by in need of a drink this place is perfectly acceptable. Although it is convenient for Verulamium Park during the day, in the evening it doesn't offer anything special to persuade the city centre drinkers to walk down the hill.